Learning to drive can be a challenging experience, but fortunately there are a number of routines you can learn to help guide you through the process. These driving routines are designed to help speed up the process of learning, making you a more proficient and confident driver. The five routines mentioned here are the ones most frequently used by instructors, but there are many other routines available and your instructor may use more than those listed here, or they may have adopted their own variations. When the time comes to take your driving test, the route taken will have been specially chosen to incorporate as many different road types and junctions as possible. Your examiner will be watching to make sure you get all your checks in as you drive around the test route. 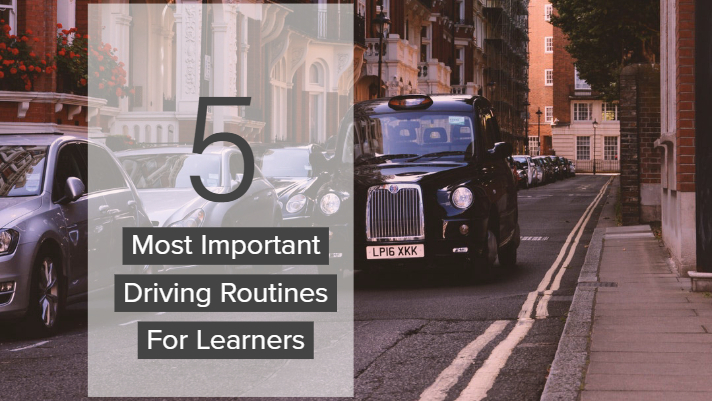 The easiest way to pass your test first time is to memorise the following routines so they become second nature to you. Also known as ‘the cockpit check’, you should carry out this routine before setting off anywhere. Its purpose is to make sure you are in a safe and secure driving position and able to control the car with proper visibility for your upcoming journey. This is the one that catches most people out on their driving test. The routine is designed to make sure you park the car safely, legally and with good control. You need to become proficient at this routine in order to pass your test. So don’t be surprised if your instructor makes you practise it many times. This is an updated version of the famous mirror, signal, manoeuvre that your dad learned when he passed his test. The M.S.P.S.L routine should be used on approach to any type of junction, including roundabouts, crossroads and T sections. Another important routine to master, the P.O.M routine should be used when moving the car off from a stationary position. Your examiner will be watching to ensure that you check to make sure it is safe to move the vehicle before progressing and that you control the car properly during the process. This is similar to M.S.P.S.L; it ensures the learner properly assesses the road ahead on approach to traffic systems, such as road junctions, pelican crossings and roundabouts. It can be difficult to master at first, but with a little practice, it will become second nature to you.